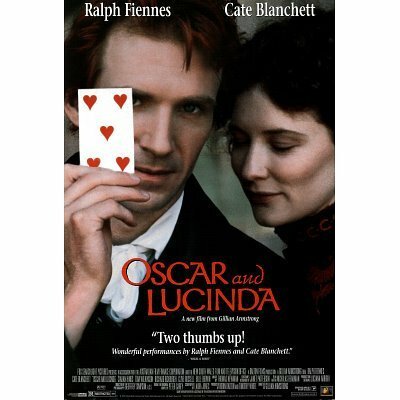 ‘Oscar and Lucinda’ is based on the novel by Peter Carey and tells the story of a young Australian heiress, Lucinda Leplastrier (Cate Blanchett) with the passion for glass and gambling who meets an Anglican priest, Oscar Hopkins (Ralph Fiennes), who has the same obsessions. The two soon strike up a close friendship, because they share the same trait of being quite unfit to live in the society as they know it due to their oddities and gambling compulsions. However, their increasing closeness soon puts to the test their obsession limits. This film directed by Gillian Armstrong (‘Little Women’ (1994)) is almost as odd and unique as its main characters. Rapidly going from comic to romantic, and ending up being tragic, the film covers almost every genre without losing its eccentricity. However, the film’s ‘strangeness’ and unusual style may be attributed to Carey book’s content and style. The book’s narrative is more factual than descriptive, and has many ambiguous paragraphs and references. The film and book do not seem to want to be understood. As its main characters, the film presents itself unconsciously. It shows off beautiful scenery and has a straightforward plot, but, in a nutshell, this film means to be a complex character study, focusing on the main characters’ turbulent interactions and relationship development. And here, it works wonders thanks to the cast and acting. Lucinda is a rich eccentric owner of a glass company who loves to bet and her stakes are high. On the other hand, we have Oscar, a self-conscious, almost fragile young man who praises gambling through the eyes of God. The interaction between these two ‘misfits’ is interesting to watch (as one struggles with her passion for glass and another combats his fear of water), and the chemistry between Fiennes and Blanchett is great. In fact, Fiennes and Blanchett seem to be perfectly cast as both are capable of portraying the character’s longing for spiritual independence with graceful ease and realism. Fiennes presents an oddity, unworthiness and humility in the face of societal dangers, already showing hints of a damaged character to be portrayed later in Cronenberg’s ‘Spider’ (2002). However, it is Blanchett who truly impresses here – vivacious, full of energy and passion, she shows that she can portray an independent, strong-willed woman with a great skill. That very skill is clearly on display in ‘Elizabeth’ (1998), and Blanchett also demonstrated her skill in portraying eccentricity in ‘The Aviator‘ (2004). The supporting cast is equally good. Ciaran Hinds as Reverend Dennis Hasset, an admirer and former partner of Lucinda, is great; and Barnaby Kay as Oscar’s college friend, Wardley-Fish also gives a very good performance. However, despite good acting and interesting character studies, all is not too well with this film when it comes to the plot composition and pace. Some may say that ‘Oscar and Lucinda’, with its emphasis on ambition and nature, is no different from any other Australian film; others may say that they expected much more from director of ‘Little Women’. In defence, it could only be said that the book itself does not give much space for any exciting manoeuvres to be made. The film is very faithful to the book, and the book is not the greatest piece of literature. Nevertheless, there is no denying that the film is dull, long and manipulative at times. Besides, the characters’ dialogue is almost too predictable. It is supposed to be a love story, and yet the audience is left wondering when, if ever, the ‘love’ part is supposed to begin. The second part of the film is more interesting, however, maybe because we can finally see some long-awaited action and hear Thomas Newman’s amazing score. Laura Jones (‘The Portrait of a Lady‘ (1996)), the script’s writer, seemed to have thought that the film’s truthfulness to the novel should take precedence over trying to make the film psychologically interesting and ‘whole’. As with ‘The Portrait of a Lady’, ‘Oscar and Lucinda’ seemed to have covered every event in the book, but with such hurry and detachment, it becomes some hasty “medical” examination, rather than an exciting and dramatic character study and a gripping film. The ending complicates the picture further. It is still unclear why the ending should be so different from the book’s conclusions, especially since the book’s ending is much more emotionally dramatic than the film’s one. Really interesting review. I randomly saw this for the first time over the weekend and agree with most of what you had to say about it. Thank you! 🙂 I just wish that more people would become aware of this one and other similar films, they do have something special in them. Now this sounds like a movie for me. I love a bit of eccentricity in my films. There is a lot of it in there! The story is interesting, and the performances impressive, even if the film overall is not that great. Well I really like how it sounds so I’ll be certain to let you know my thoughts on it.